Purchase 12" x 12" interlocking tiles by the case, snap them together to create any size mat. 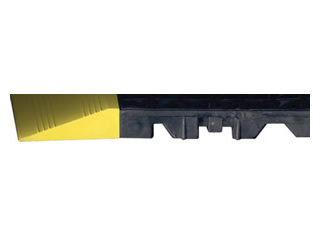 Optional 2.5" yellow safety border is available. The ideal choice for industrial commercial environments. 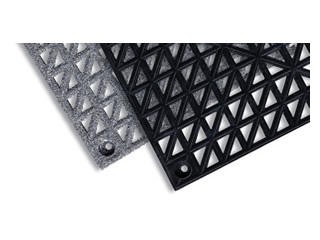 The waffle grid design allows fluid to pass through the tile keeping the surface dry and less slippery. 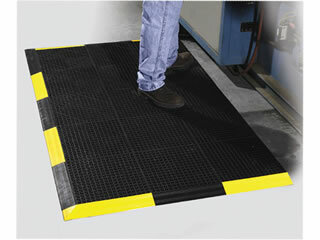 Includes 2.5" alternating yellow & black border on three sides of the mat. 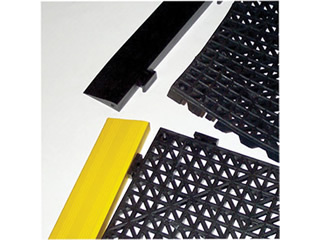 Tiles are made from 100% recycled plastic. Recommended for Oily, greasy industrial commercial work cells, bar and kitchen wet areas, food processing work cells and more.